Our first day of wine touring on the Central Coast had been a busy one, with four winery and tasting room visits in Paso Robles and nearby areas. 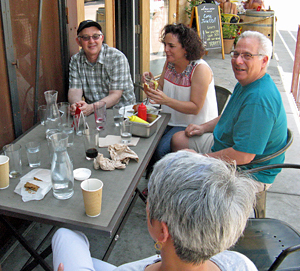 It was a pleasant day for Jane, Chris, Alan, and me despite the 110+ degree heat in Paso Robles. We knew that Saturday would not be the typical wine touring day, as Alan and I were both due to attend the wedding of our friends’ son in Santa Ynez Valley late in the afternoon. We’d need to check into our accommodations in the area and change clothes before meeting up with another friend and heading to the wedding and reception. With all that, we knew we’d have limited time for wine-tasting that day. Jane and Chris were meeting other friends in Santa Barbara County on Saturday, so they took off from Paso early. I had scheduled one winery visit in the morning, and Alan and I drove south from Paso, through San Luis Obispo, and into Edna Valley for our appointment. It’s regarded as a cool-climate area, known for its Chardonnay and Pinot Noir vineyards, but the intense heat we experienced in Paso Robles followed us to Edna Valley that morning. Claiborne & Churchill 2016 Dry Gewürztraminer, Central Coast. This displayed stone fruit, lychee, spice, and subtle herb notes on the nose. Medium-light bodied with fine acidity and a long finish, nice. Claiborne & Churchill 2016 Dry Riesling, Edna Valley. Bright and upfront citrus fruit with floral and herbal undertones. Zippy acidity with a clean, crisp finish. Claiborne & Churchill 2014 Dry Riesling, Estate, Claiborne Vineyard, Edna Valley. Much different from the previous wine, this featured stone fruit and mild petrol aromas with notes of lemonpeel and earth. Moderately rich yet lively texture with a chalky note on the finish – nice now, and this should develop well with more time in the bottle. Claiborne & Churchill 2016 Edelzwicker, Edna Valley. 50% Riesling, 33% Gewürztraminer, 17% Pinot Gris. Lots of upfront ripe stone fruit, with touches of lychee, flowers, and spice. Medium-rich texture with just a touch of sweetness on the finish. Claiborne & Churchill 2016 Rosé of Pinot Noir, “Cuvée Elizabeth,” Edna Valley. Fresh red berries, spice, earth, and floral undertones on the nose. Medium-light weight with bright acidity and a clean finish, nice. Claiborne & Churchill 2015 Pinot Noir, “Classic,” Estate, Edna Valley. Fairly light in color, this was very aromatic, with flowers, cherry, tea leaf, and hints of earth and spice. Medium-bodied with a lively texture and fine tannins on the finish, nice. Claiborne & Churchill 2015 Pinot Noir, “Twin Creeks,” Estate, Edna Valley. This had more earth, herb, and spice notes upfront, along with plum and black cherry fruit. More structured than the previous wine, finishing with moderate tannins. Claiborne & Churchill 2015 Grenache, Spanish Springs Vineyard, San Luis Obispo County. Bright strawberry fruit, plus spice, dried herbs, and a floral note on the nose. Medium weight with vibrant acidity and noticeable but refined tannins, nice. Claiborne & Churchill 2009 “Port Obispo,” San Luis Obispo County. Aromas of spice, smoke, brown sugar, and blueberry. Good structure and balance, with a long, moderately sweet finish. When Alan and I arrived at Claiborne & Churchill Vintners in Edna Valley around mid-morning, it was already creeping above 90 degrees in that normally cool region. The entrance to the winery parking area is marked by a large oval oak cask – typical of the type used in Alsace – a good clue as to the inspiration of the wines. 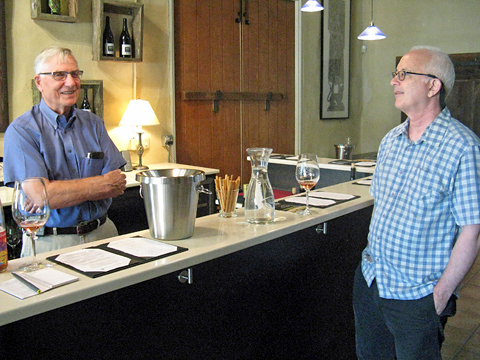 We headed into the tasting room, where owner Claiborne “Clay” Thompson greeted us. I’ve been to the winery before but this was the first time I’d met Clay. He had suggested meeting before the regular tasting room hours started so we would have time to talk before things got busy there. The winery has an outdoor tasting area in addition to its main tasting room, but due to the hot weather that day, a couple of Clay’s staff were bringing in barrels and wood tops from outdoors and setting them up in a corner of the tasting room. Claiborne & Churchill’s Alsatian-style white wines were some of the first wines that really impressed me during my very first wine trip to the Central Coast 25 years ago, and they remain well-known for them today. 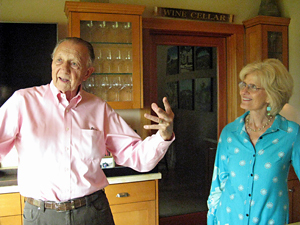 Clay and his wife Fredericka Churchill founded their winery in 1983. They had both taught at the University of Michigan (Clay was a professor of Old Norse) before moving to California in 1981, with a career change in mind and inspiration from the dry white wines of Alsace. The couple had lived for a time in Germany and France and fell in love with Alsatian varieties there, and they felt that the cool climate of Edna Valley would be a perfect spot to grow them in California. After a few years learning the basics of winemaking while working at another local winery, Clay and Fredericka launched their new label with Dry Riesling and Dry Gewürztraminer, and nearly 35 years later these are still Claiborne & Churchill’s signature wines. At the time they started the label, it was rare to find truly dry bottlings of these varieties in California though more vintners have been making them in recent years. 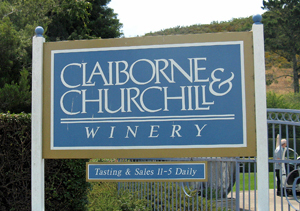 The first vintage of Claiborne & Churchill wine came from four tons each of Riesling and Gewürztraminer from nearby Paragon Vineyard, and early on the wines were made at the Edna Valley Vineyard facility and later in a warehouse winery. The current winery building, completed in 1995, was a trailblazer – the first commercial strawbale building in California. The building has received awards from both the American Institute of Architects and the US Green Building Council. Clay told us that the 16-inch thick walls made from rice straw help a lot with maintaining the winery temperature without needing mechanical cooling – it certainly stayed cool inside on that hot morning – and he’s been very happy with the building. Winemaker Coby Parker-Garcia was an intern at Claiborne & Churchill while he attended Cal Poly San Luis Obispo, and came on board full-time as assistant winemaker in 2004 – he’s been the head winemaker since 2007. From that initial 1983 vintage of fewer than 600 cases, the winery production is now around 8,000 cases per year. In addition to buying fruit from other vineyards in Edna Valley and elsewhere in the Central Coast region, Claiborne & Churchill has two estate vineyards. Claiborne Estate Vineyard is adjacent to the winery and is planted to two clones of Riesling (17 and 49) and two of Pinot Noir (115 and 777), while nearby Twin Creeks Vineyard is planted entirely to Pinot Noir, with Pommard, Martini, 2A, 113, and 667 clones. Clay started out our tasting with the 2016 Dry Gewürztraminer, made with fruit from Monterey County. True to the label, the wine is very dry, with only 0.2% residual sugar. It featured classic Gewürz aromatics, and avoided the bitter finish that the variety can have when fermented this dry. Next was the crisp and floral 2016 Dry Riesling, sourced from Wolff Vineyard and Talley’s Oliver’s Vineyard, both in Edna Valley. The whites are made mostly in stainless steel, but all are at least partly aged in oak. Most of the white wines, as well as the rosé, are bottled under screwcap – this has been the case since about 2008. Clay asked us if we’d like him to open a bottle of the 2014 Estate Riesling, and it was an easy call to accept his offer. This wine comes from two Riesling clones, one of them an Alsatian clone that’s unusual in California, and it’s bottled with a cork closure and aged longer prior to release than their basic Dry Riesling. The Estate bottling displayed a more noticeable petrol element with good potential for aging – definitely a more “serious” bottling of the variety. Clay next poured us the 2016 Edelzwicker, an off-dry blend of Riesling, Gewürztraminer, and Pinot Gris that’s more fruit-forward. We followed this with the 2016 “Cuvée Elizabeth” Rosé of Pinot Noir, named for Clay and Fredericka’s daughter. From early-picked fruit that was pressed after being on the skins for a couple of days and fermented in neutral oak, this was one of the best rosé wines I tasted on my Central Coast trip – fresh, spicy, and with just the right touch of mild tannic bite on the finish. As we tasted with Clay, we couldn’t help but notice the eye-catching medieval artwork on a couple of the tasting room walls. He told us that these are rubbings from brass effigies in England that were made while he was doing research for a book there. We moved along to three Pinot Noir bottlings, starting with the beautifully floral 2015 “Classic” Pinot Noir. The fruit comes from the winery’s estate vineyard sites. Next was the 2015 “Twin Creeks” Pinot – more briary and structured. The bright, red-fruited 2015 Grenache was a standout. The fruit was sourced from Spanish Springs Vineyard not far from Pismo Beach – quite a cool-climate location for Grenache, and this bottling was less than 13.5% alcohol, quite low for the variety and resulting in terrific acidity. Clay mentioned that work is proceeding on a “San Luis Coastal” AVA to include coastal sites such as Spanish Springs that are west of existing designated appellations. Brian Talley is heading up effort on this, and I think that this will be a worthy AVA designation if it’s approved. We concluded our tasting with the 2015 “Port Obispo” made from a number of varieties – at about 6.5% residual sugar, it’s sweet but not overpowering, a nice way to finish up. Current Claiborne & Churchill wines that we didn’t taste on this visit include Pinot Gris, Greengate Ranch Vineyard Pinot Noir, “Runestone” Pinot Noir, “Straw Bale Red” (Pinot-based blend that also includes Merlot, Grenache, and a touch of Syrah), and “Nektar” Late Harvest Riesling. They’ve also produced a number of other recent wines including Dry Muscat, “Cuvée Fredericka” white blend, Chardonnay, Syrah, Malbec, and other small-production bottlings. I really enjoyed talking with Clay on this visit to Claiborne & Churchill. The winery stands out in its longtime commitment to Alsatian-style white wines, and they continue to make some of the best from this region. I think the red wines have really improved over the years, and these latest reds are easily the best I’ve tasted from the winery – the cool-climate Grenache was a particularly pleasant surprise. Favorites included the 2016 Dry Gewürztraminer, 2014 Estate Dry Riesling, 2016 “Cuvée Elizabeth” Rosé of Pinot Noir, 2015 “Classic” Pinot Noir, and 2015 Spanish Springs Vineyard Grenache. You’ll find something a little different at Claiborne & Churchill from most Edna Valley wineries, and I consider this to be a “must” stop when wine-tasting in the area. Alan and I decided to grab a quick lunch at In & Out Burger in Arroyo Grande, and since we still had some time, we took the “scenic route” along Highways 1 and 135, joining back with 101 a little north of Los Olivos in Santa Barbara County. Along the way, we could see the huge plume of smoke from a large wildfire – the Alamo Fire that was burning in the rugged mountains and canyons east of Santa Maria. We continued to our accommodations at the WorldMark timeshare facility in Solvang, where we’ve stayed with Jane and other friends several times before. 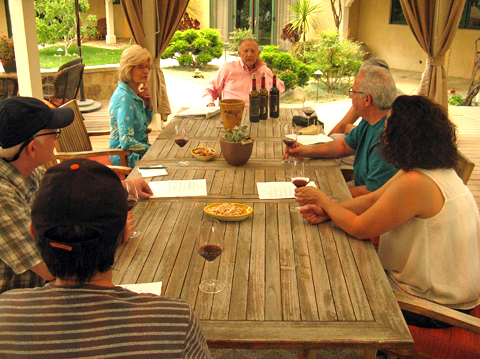 It’s a convenient and comfortable base of operations for wine-tasting in Santa Barbara wine country. Fortunately we were able to check into our unit there early, since there would be a shuttle bus for wedding guests stopping right up the street, and we didn’t want to miss it. It was over 100 degrees in Solvang so even the short walk to the bus had us sweating. We met our friend Koji outside the bus – he was staying a hotel up the street from us – and we headed to the wedding and reception, held at Gainey Vineyard, a few miles east of Solvang and Santa Ynez. On the way to the wedding, we spotted smoke from another wildfire – the Whittier Fire in the hills above Santa Ynez Valley broke out shortly before we’d arrived in Solvang that afternoon. It was hot at the outdoor wedding, but thankfully it cooled down significantly for the reception after the sun went down. 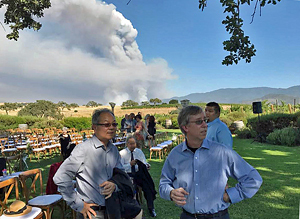 The smoke and flames from the fire were easily visible from the winery, and low-flying fire-fighting helicopters and planes went back and forth all through the wedding and reception. Even with the hot weather and the all-too-close wildfire, it was great to see our friends’ son get married at a beautiful setting. One of the nice things about staying at the timeshare facility in Solvang is being able to have more relaxing mornings, and we enjoyed coffee and toast there before heading out for the day. I’d only scheduled two winery appointments for that Sunday, leaving the afternoon open for tasting room drop-ins or whatever we felt like doing. Since there were only four of us in our wine touring group, we were able to fit into one car, and Alan volunteered to drive. The sky was smoky and there was a noticeable coating of ash on the cars that morning from the Whittier Fire to the east of us. The one good thing about the smoke in the air is that it probably helped cool the temperature a bit, and although it was still hotter than we would have liked, at least we weren’t destined for triple-digit heat that day. It wasn’t a long drive from Solvang to our first appointment of the day, just a couple of miles up Alamo Pintado Road from Highway 246. Buttonwood 2016 Sauvignon Blanc, “Zingy,” Estate, Los Olivos District. Very light color, with bright grapefruit and herb aromas plus floral undertones. Lighter-bodied with a fresh finish – and yes, the acidity is zingy! Very nice. Buttonwood 2016 Sauvignon Blanc, “Musqué,” Estate, Los Olivos District. Floral aromas were upfront with this wine, along with tropical fruit and a touch of citrus. Richer mouthfeel than the previous wine but still with good acidity and a crisp finish. Buttonwood 2016 Sauvignon Blanc, “Signature Blend,” Santa Ynez Valley. 92% Sauvignon Blanc, 8% Sémillon. Citrus, melon, herbs on the nose, plus a hint of stony minerals. Moderately creamy texture with juicy acidity and a clean finish, nice. Buttonwood NV “Hop On,” Batch #2. Dry-hopped Sauvignon Blanc. Citrus and herb aromas with hoppy undertones. The hoppy IPA-like character really came out in the mouth. Medium weight with a lively finish – certainly distinctive. Buttonwood 2016 Grenache Rosé, Estate, Los Olivos District. Light pink color, this featured bright, fresh strawberry aromas along with flowers and herbs. Vibrant acidity with a touch of tannin on the crisp finish, nice. Buttonwood 2013 “Classic Cuvée,” Estate, Santa Ynez Valley. 40% Cabernet Sauvignon, 40% Cabernet Franc, 10% Merlot, 10% Malbec. Upfront ripe cherry and currant, with dried herb and hints of spice and sweet oak. Medium-bodied with nice acidity and fine tannins. Buttonwood 2014 Cabernet Franc, Estate, Santa Ynez Valley (pre-release). 100% Cabernet Franc. Bright aromas of plum and black cherry, dried herbs, flowers, and a stony mineral note. Medium weight on the palate with lively acidity and moderate tannins – already tasty and should age well too, quite nice. Visiting winemaker Karen Steinwachs at Buttonwood Farm is always fun. We’d arranged to meet her at the winery building, which is located past the tasting room on Alamo Pintado Road and along a dirt road that leads up a bluff to a hilly mesa where the estate vineyard is located. We were also meeting our friend John Tomasso there – or so I thought. I’d neglected to tell him that we were meeting at the winery and as we were waiting for him, I received a series of increasingly annoyed text messages wondering where we were (the texts kept coming one after another before I could respond!) – it turned out that he was waiting for us outside the tasting room. Once we cleared up the miscommunication, John joined us at the winery in just a couple of minutes. Standing outside that morning was sort of a surreal experience, with a smoky bronze-colored sky and ash falling like light snow, all from the wildfire to the east that had started the previous day. Now that everyone was assembled, we stepped inside the winery. Buttonwood Farm is not just a winery and vineyard but a real working farm. They raise animals, grow flowers, and tend orchards in addition to growing winegrapes. The 106-acre property was purchased in the 1960s by Betty Williams, who passed away in 2011 at 92 years old. Betty’s son-in-law Bret Davenport now runs the business, while her daughter, artist Seyburn Zorthian, designs the distinctive wine label artwork. Betty Williams began growing organic vegetables in the late 1960s, long before organic farming became popular. Betty Williams had the Buttonwood Farm vineyard planted in 1983 by Michael Benedict, and it now has 39 acres of vines. Varieties currently planted include Sauvignon Blanc, Sémillon, Grenache Blanc, Merlot, Cabernet Sauvignon, Cabernet Franc, Malbec, Syrah, and Grenache. Karen told us that they’ve added several more acres of Sauvignon Blanc in recent years, and they’re planning to plant more Cabernet Franc. Nearly all the estate fruit goes into the Buttonwood wines, and aside from Pinot Gris, Chardonnay, and Pinot Noir (from Hibbits Ranch on the western edge of Sta. 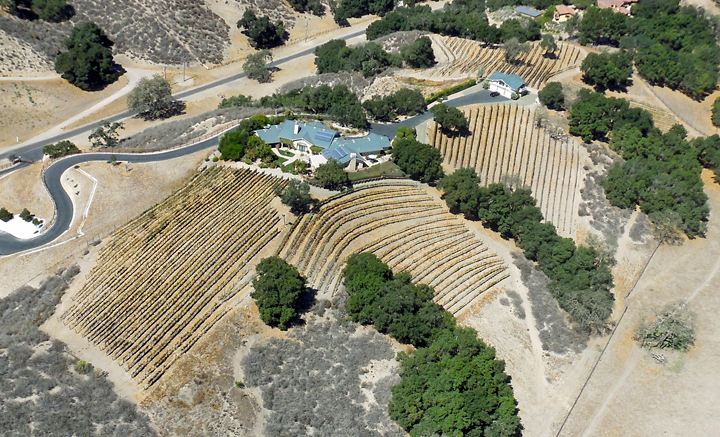 Rita Hills near Lompoc), all of Buttonwood’s wines are made from their estate vineyard fruit. The Buttonwood Farm estate vineyard is in the heart of the new Los Olivos District AVA approved in early 2016, near the center of Santa Ynez Valley. The hilly vineyard – up on the mesa next to the winery – is situated on rocky and sandy alluvial soil and is farmed using mostly organic methods, although it’s not certified. All the vines there started out as own-rooted – though some have been grafted over to different grape varieties through the years – and they’re all cane-pruned. Karen credits Buttonwood’s longtime vineyard manager, Armando Zepeda, for the fruit quality there – he’s been there since the vineyard was first planted over 30 years ago. She also gives credit to viticulturist Francisco Ramirez and soil expert Stan Kadota.. Cover crops in the vineyard include sweet pea, barley, and fava beans. Karen mentioned that with the dry weather over the past few years, the crew has found more critters visiting the vineyard – not only deer and coyotes, but bobcats, mountain lions, and even badgers. I first met Karen about 12-13 years ago when she was the assistant winemaker at Fiddlehead, working there with Kathy Joseph. She has a degree in business management and spent about 20 years in high-tech business. Her first winery job was with Norm Yost, then the winemaker at Foley Estates. After a few years at Foley and a few more at Fiddlehead, Karen joined Buttonwood as their winemaker in 2007. She also has her own label, Seagrape Wine Company, making Chardonnay and Pinot Noir from Sta. Rita Hills fruit. The original Buttonwood winery building was completed in 1989, and further additions have been built over the years. The winery makes around 8,000 cases per year, with Sauvignon Blanc being the biggest production. Karen had set up some wines on a barrel for us to taste, just inside the winery door. After a short time, we were joined by her friend “Crabby” Steve Escobar – no, he’s not ill-tempered, he’s a commercial rock crab and lobster fisherman! He’s also studied agriculture business and culinary arts so he’s got quite a well-rounded background. Karen knew that our next winery appointment that day was with a specialist in red Bordeaux-style blends, so she mostly steered away from those on the wines she chose for our tasting. I know from past experience that Buttonwood produces some very good red wines from Bordeaux varieties, which tend to be more restrained and elegant than some others from the region. As is often the case at Buttonwood tastings, we started with the “Zingy” Sauvignon Blanc. This was the 2016 vintage, and as with all “Zingy” bottlings, it’s made from clone 1 Sauvignon Blanc fruit, whole-cluster pressed and made entirely in stainless steel with no malolactic fermentation. Karen noted that the first “Zingy” was made in 2007, her first vintage at Buttonwood, and that it was actually the winery’s first 100% varietal Sauvignon Blanc – earlier vintages always had some Sémillon blended in. Karen decided to keep one particular block separate in that vintage and that became the first “Zingy.” This wine is usually but not always made from the same block of vines, and it’s generally the first fruit picked in the vineyard each harvest. Why the name for this wine? Try it and you’ll know! Beyond the citrus and herb aromas you’ll find a characteristic “zingy” acidity – this wine is always a favorite. All of the Buttonwood Sauvignon Blancs are fermented in stainless steel at temperatures of about 53-54 degrees for about 3 weeks. The next one Karen poured for us was the 2016 “Musqué” Sauvignon Blanc, a newer bottling for the winery and not surprisingly made from the more floral Musqué clone of the variety. A third Sauvignon Blanc was the 2016 “Signature Blend”, with 8% blended Sémillon. The Sémillon component of the wine is fermented in French oak, about 20% new Damy barrels. Karen mentioned to us that Buttonwood uses screwcaps for wines that are more highly-distributed wines as opposed to those sold mainly through the tasting room, as well as for wines that go to restaurant by-the-glass programs and for “drink it now” wines. Wines with cork closures use DIAM technical corks. We changed gears with a newer bottling that was suggested by the Buttonwood crush crew – the non-vintage “Hop On”. This is a dry-hopped Sauvignon Blanc, the first wine of its kind made in California. After the Sauvignon Blanc finishes fermentation, a variety of hops are suspended in “tea bags” in the wine for about 3 weeks. Karen told us that getting government approval for the wine label was a major hassle, and they would not permit the label to designate a vintage or appellation. This wine was quite distinctive – a combination of Sauvignon Blanc aromatics and IPA-like flavors. Next was a 2016 Grenache Rosé, from fruit picked early for rosé from an early-ripening block. Buttonwood makes a very good Syrah Rosé but they often sell out of that wine so quickly that they’ve added the Grenache version so they’ll have more rosé available to sell. Karen has a real knack for rosé and this one is another winner. We finished with two red Bordeaux variety wines. The 2013 “Classic Cuvée” is a red Bordeaux blend that Karen calls their “Wednesday wine” – not necessarily the bottle you’d choose for a fancy dinner but a fine mid-week drinker. It’s mostly Cabernet Sauvignon and Cabernet Franc. Our final wine was a pre-release bottle of 2014 Cabernet Franc – another Buttonwood wine that’s been a consistent favorite of mine. Karen told us that the Cab Franc vines are planted on their own roots, have thin skins and tiny berries, and need some sun and wind but not too much. The wine is aged for 30 months in 20% new Bel Air barrels. Bright, herbal, and floral, this will be another fine vintage of Cab Franc from Buttonwood. Buttonwood makes a number of other bottlings in addition to the ones we tasted with Karen. These include “Devin” (Sauvignon Blanc / Sémillon blend), Pinot Gris, Grenache Blanc, Pinot Noir, Cabernet Sauvignon, “Trevin” red Bordeaux blend, Merlot, Malbec, Grenache, Syrah, a couple of dessert wines, and a Blanc de Noirs sparkling wine. I always have a great time visiting with Karen at Buttonwood – her understated sense of humor keeps the atmosphere light, even when we’re tasting some serious wines. Buttonwood is particularly famed for its Sauvignon Blancs, and this tasting demonstrated once again why that’s the case. All four of the Sauvignon Blanc-based bottlings we tasted (including the dry-hopped “Hop On”) were delicious and distinctive, with the 2016 “Zingy” and 2016 “Signature Blend” being particular favorites. And though we only tasted three other Buttonwood wines on this visit, the 2016 Grenache Rosé and 2014 Cabernet Franc were also standouts. The one characteristic that ran through all of the wines that Karen opened for us was the refreshing acidity – it’s the sort of thing that makes you want to pour yourself another glass. An established producer such as Buttonwood can sometimes be overlooked in the search for the newest or trendiest wineries, but Karen has been making outstanding wines there, and Buttonwood should be on everyone’s list of tasting rooms to visit in Santa Ynez Valley wine country. Baehner Fournier 2016 Sauvignon Blanc, Vogelzang Vineyard, Happy Canyon of Santa Barbara. This was lightly floral, with notes of melon and stone fruit. Moderately creamy texture, with fine acidity and a lively finish. Baehner Fournier 2015 Rosé de Merlot, Estate, Los Olivos District. Light pink/salmon color, with bright cherry aromas along with touches of flowers and fresh herbs. Medium-light bodied with a lively mouthfeel and just a hint of tannin on the finish, nice. Baehner Fournier 2013 Petit Verdot, Estate, Santa Ynez Valley. Plum and darker berry fruit, spice, and dried herbs on the nose. Medium-full bodied with good structure and big but refined tannins, nice. Baehner Fournier 2013 Cabernet Sauvignon, Estate, Santa Ynez Valley. Forward black cherry and plum aromas, with tobacco/dried herb, spice, and a touch of sweet oak in the background. Fairly big and structured, with a firm tannic finish. Baehner Fournier 2014 “V3,” Estate, Los Olivos District. This displayed plum, herbs, earth, and notes of flowers and mocha. Bold mouthfeel but smoother texture than the other two reds, with fine tannins on the finish, already delicious though it should develop with further cellaring too. Our second Sunday morning appointment was with Dr. Bob Baehner and Vickie Fournier Baehner of Baehner Fournier Vineyards. It was a fairly short drive into the hills not far east of the town of Los Olivos. I had come across the Baehner Fournier wines several times at the old Ballard Inn tasting bar when our friend Barry Rossum ran it. The wines struck me as some of the best red Bordeaux-style blends I’d tried from Santa Barbara County, and I thought this would be a good time to visit and learn more about the vineyard and wines. We were joined again on this visit by John Tomasso as well as by Amy Dixon, who runs The Baker's Table artisan bakery in Santa Ynez. 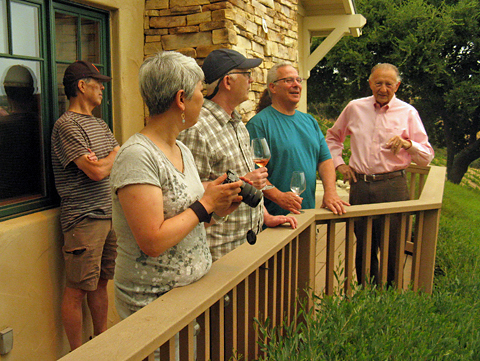 We drove up to Bob and Vickie’s home, on a knoll above their vineyard, and they warmly welcomed us inside. Their very friendly cat “Miss Bones” made sure to greet us as well! Bob’s background is as a pediatric hematologist/oncologist (I had to look that one up! ), while Vickie is a travel consultant. Bob and Vickie have enjoyed great wine and food during their travels over the years and the idea of having their own vineyard and making wine appealed to them. In 1999, Bob was teaching at USC and was looking to retire, so they started looking for land where they could plant a vineyard. They bought their 17-acre property in Santa Ynez Valley in 2001 and started planting five acres right away, and they’ve lived there full-time since 2007. The site is at about 1,000-foot elevation, around 400 feet higher than the valley floor, and just inside the boundary of the new Los Olivos District AVA. Bob and Vickie had 5,000 vines planted on their hillside property – 60% Cabernet Sauvignon (two clones) plus 20% each Merlot and Petit Verdot. There are actually five separate small vineyard sites – Northstar, Rainbow, Moonglow, Sunshine, and Misty. The names are based on their experiences with nature at the different locations on their property. The site has rocky loam soil with a clay base and the yield from the vines is low, typically only around 1 to 1½ tons per acre. Bob and Vickie have worked with three noted local winemakers since their first commercial release from the 2005 vintage, and Steve Clifton took over the winemaking in late 2012. Steve makes the wines at his facility, and current annual production is about 500 cases. Steve also works with the vineyard management team to ensure that the vines are farmed in the way he wants. All of the Baehner Fournier wines are made from estate fruit except for their Sauvignon Blanc, which comes from Vogelzang Vineyard in Happy Canyon. Inside their beautiful house, Bob and Vickie led us to a room that they use as a tasting bar, and they poured us a couple of their wines to get started with tasting. The 2016 Sauvignon Blanc was whole-cluster pressed and fermented in neutral oak, where it was aged for six months before bottling. Besides being the only wine not made from estate fruit it’s also the only one that does not go through a native yeast fermentation. The first vintage of Baehner Fournier Sauvignon Blanc was the 2012. Next was the 2015 Rosé de Merlot, crushed and kept on the skins before pressing in order to pick up color and complexity – this was particularly nice, with bright cherry aromas and more texture than many rosé wines. After these two wines, we followed Bob and Vickie out to their rear patio and around the side of their house to look at one of the adjacent vineyard blocks. It was quite a view down the hillside, with old oak trees at the ends of the vine rows. Since the temperature outside was considerably cooler than the previous day, we decided that it would be pleasant to sit out at the large, shaded patio table to taste the Baehner Fournier red wines. Our first red was the 2013 Petit Verdot, which has 10% Merlot blended in. The tannins in Petit Verdot can be harsh but this one had a nicely-managed tannic structure. We followed this with the 2013 Cabernet Sauvignon. Bob and Vickie noted that the bottle had been opened up two days earlier, but this may have worked to its advantage, helping to soften the wine a bit though it still displayed plenty of structure. Our final wine was the 2014 “V3” – Vickie referred to this as “our vineyard in a glass.” Like the vineyard as a whole, it’s about 60% Cabernet Sauvignon and 20% each Merlot and Petit Verdot. The wine was aged for 18 months in barrel, with about 30% new French oak (typical oak program for the reds). The “V3” is the first of the 2014 vintage reds to be released. In addition to the wines we tasted with Bob and Vickie, Baehner Fournier also makes a Merlot – the current 2013 vintage was blended with 17% Cabernet Sauvignon. The easiest way to taste and buy the Baehner Fournier wines is by visiting The Good Life Cellar on Mission Drive in Solvang, where all of their wines are available. We all had a great time visiting Bob and Vickie at their home. They were gracious and generous hosts, and it almost seemed like a bonus that their wines were so good! It was nice to be able to take a look at their vineyard too – it’s quite a scenic spot. I enjoyed all of the wines Bob and Vickie poured for us, particularly the 2015 Rosé de Merlot, 2013 Petit Verdot, and 2014 “V3.” Over the years, Santa Barbara County wineries have not been known for wines from red Bordeaux grape varieties, though of course there have been some exceptions. But I’ve found that over the past 10 years or so, the overall quality of these types of wines from the area have taken a significant step up, especially as newer producers such as Baehner Fournier have started up. Bordeaux-style wines from the region now deserve to be taken seriously alongside Chardonnay, Pinot Noir, and Rhônes, and Baehner Fournier’s wines are well worth checking out if you’re in the area. Jane, Chris, Alan, and I drove to Buellton for a late lunch at one of our favorite places in the area, Industrial Eats. It’s always busy but it was really packed that day, and the only place we were able to find a place to sit was at a small table outside. Fortunately we were in the shade, and with the cooler weather that day it was actually pleasant to be outdoors, where John and Amy joined us a short time later. I ordered the burger – they typically only serve them on Sundays – and it was one of the better ones I’ve had in awhile. Jane and Chris split a pizza that smelled amazing. All I can say is that if you’re visiting the area and don’t stop at Industrial Eats, you’ll be missing out big-time. We said goodbye to John and Amy after lunch, and since it was already about 2pm, the rest of us just felt like going back to the timeshare to crash until dinner. We drove up Highway 101 to Los Alamos for dinner at Full of Life Flatbread. I’ve been there before and really enjoyed their food, but I have to say that Industrial Eats was too tough an act to follow. I’m sure I’ll be back to Full of Life Flatbread though – it just suffered a bit by comparison on this occasion. After heading back to the timeshare facility in Solvang, we all turned in early to get ready for a full day of wine touring the following day.